Foliotek help is built to help you get the most out of your presentation portfolio building experience. Use the navigation on the right to drill down to the topic that best fits your question, or search for the terms you are looking for. Don't quite know what a portfolio is or why you should have one? Don't worry, learn all about portfolios. Let's get you rollin' by showing you how to create a new portfolio. Design is a tricky word, so we want to help get you going with some basic tips. Not too long ago we added the ability for you to upload your own images as a background. We've taken that a step further and now allow you to upload your own image to go behind your header. Not only that, but we added some image editing functionality so that when you add your header image, you can make it black & white, flip it (horizontal or vertical), resize, and a few other cool tweaks. Have fun playing with your portfolios by adding in your own images. This is an excellent way to show your own identity. Currently, the process for doing this rests within the style editor of the designer. In the future, we hope this feature will be more prominent as we continue to improve the portfolio creation process. We encourage users to add in their own images, then let us know what they think. Rest assured, in the weeks to come, additional templates will arrive with new header images from which to choose. 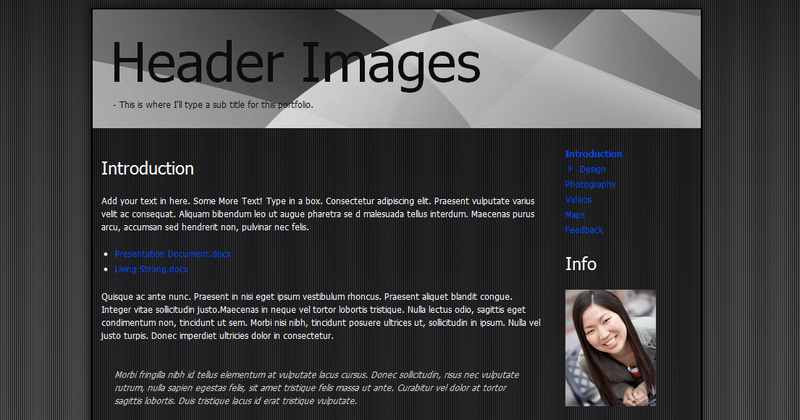 Click on "Top" - this will give you the ability to edit the box behind the content of your portfolio header. You should see an option to add an image in the first column of the style editor. So don't be shy, upload an image and send us a note on what you think.